The 'here today, gone tomorrow' nature of Web pages can stymie researchers who want to reference information, only to have the page in question change or go away. To save the data, you can cut and paste everything to your own documents. Or you can use iCyte (free). ICyte helps you collect--and keep--your Web research and your thoughts without leaving your Firefox or IE browser. 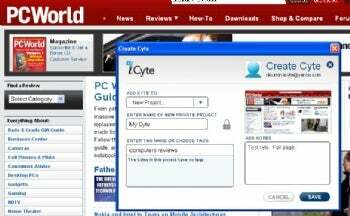 With a free iCyte account and browser add-on, you can simply right-click a Web page and create a 'cyte,' which saves a snapshot of that page to your online iCyte account. You can choose to add the cyte to an existing project or use it to start a new one, and you can also add tags and notes to the cyte. Storing the data online with iCyte means you don't have to worry about losing the data after a hard drive crash, and that you can easily share it with others. But it of course also means that you'll need Internet access to get to your saved information. You can then log into your iCyte account to see all your projects and cytes in a clean, organized display. For any given cyte, you can view the saved snapshot, or head to the live page as it currently exists. You'll also find a nice management interface for changing a project's name, making it public or private, or inviting another iCyte user to join your project. The add-on's only real drawback is that it doesn't yet work with Internet Explorer 8. The company says it should have a compatible version by the early fall. It is currently listed as an experimental add-on for Firefox, but it didn't toss up any bugs or any other problems during the time I spent with it. iCyte is dead-simple to use, and could be a major free boon to anyone who does much Web research--or just wants to save page content that might otherwise change.